Image Challenge 10 was a case of malaria caused by Plasmodium vivax. Trophozoites are amoeboid and the parasitized red blood cells are enlarged (1.25× to 1.5×). Some are very distorted. 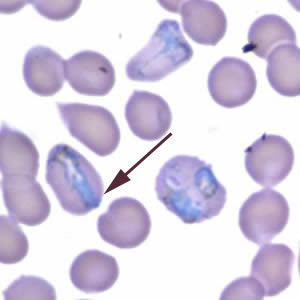 In the image below , there is a trophozoite (see black arrow) that may be mistaken for a band form parasite, suggestive of P. malariae, however the red blood cell is reasonably enlarged. In infections with P. malariae parasitized red blood cells do not become enlarged. Due to the type of stain used, Schüffner's dots (stippling) are not visible, however the other features are sufficient for a diagnosis of P. vivax.